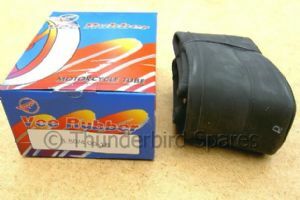 Inner Tube 3.50 4.00 x 18 4.10-4.60 90 100 90-110 90 Classic Bike Use. Inner Tube, 3.50/4.00 x 18 (4.10-4.60/90, 100/90-110/90), Classic Bike Use. This is a new, good quality, motorcycle inner tube to fit 3.50/4.00 x 18 classic motorcycle tyres. We have selected these to fit the imperial tyre sizing as used in the 1940s,50s & 60s but they also fit the more modern 4.10/90, 4.25/90 , 4.60/90x 18 & 100/90, 110/90 x 18 tyre sizes.